Phish is one of the top 10 bands you need to see live before you die. I’m not exaggerating. There are only a few jam bands worth taking a trip out to see, and bearing witness to a Phish show is like going to Disney World. Phish is the Wegmans of jam bands. The show on July 15th at CMAC in Canandaigua, New York was the first Phish concert I ever attended. Four friends and I purchased lawn tickets and prepared for the time of our lives. Lawn tickets may not sound glamorous, especially when you’re surrounded by hippies from every decade. However, the lush greenery and beauty that is Canandaigua, NY made up for the value seating. 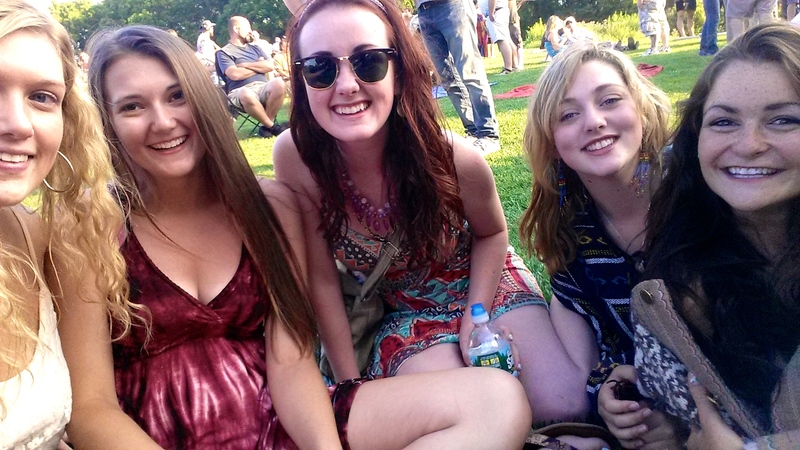 My friends and I sitting on the lush greenery that is CMAC. Phish had just put out a new studio album less than a month before the show, the first in five years. Fuego quickly became the album of the summer for me. A hungry desire for the new songs came from the crowd, as well as a yearning for the band’s older material. Phish did not disappoint. Opening with “Buried Alive,” the band’s first set featured many classic and popular jams. By the time the second set began, the sun had set and glow sticks were in the hands of many fans. Phish played a few songs off their new album, including the title track “Fuego.” What was especially different about the show at CMAC was that Phish played absolutely no covers at this show. It was the first time on the 2014 summer tour that they had done so. My first Phish experience was completely organic. If jam bands aren’t your thing, I say you haven’t lived. Everyone should experience a Phish show. It’s better than Spring Weekend. Next The Second Royal Baby is On its Way! Tell us more! What surprised you? What did you see that you’ve never seen at a concert before? Was there a moment that made you laugh?